Various methods have been recently employed to characterise the structure of biological networks. In particular, the concept of network motif and the related one of coloured motif have proven useful to model the notion of a functional/evolutionary building block. However, algorithms that enumerate all the motifs of a network may produce a very large output, and methods to decide which motifs should be selected for downstream analysis are needed. A widely used method is to assess if the motif is exceptional, that is, over- or under-represented with respect to a null hypothesis. Much effort has been put in the last thirty years to derive -values for the frequencies of topological motifs, that is, fixed subgraphs. They rely either on (compound) Poisson and Gaussian approximations for the motif count distribution in Erdös-Rényi random graphs or on simulations in other models. We focus on a different definition of graph motifs that corresponds to coloured motifs. A coloured motif is a connected subgraph with fixed vertex colours but unspecified topology. Our work is the first analytical attempt to assess the exceptionality of coloured motifs in networks without any simulation. We first establish analytical formulae for the mean and the variance of the count of a coloured motif in an Erdös-Rényi random graph model. Using simulations under this model, we further show that a Pólya-Aeppli distribution better approximates the distribution of the motif count compared to Gaussian or Poisson distributions. The Pólya-Aeppli distribution, and more generally the compound Poisson distributions, are indeed well designed to model counts of clumping events. Altogether, these results enable to derive a -value for a coloured motif, without spending time on simulations. Descriptions of biological networks serve two main purposes. On the one hand, it enables to address questions related to the evolution of the network, that is, how such a complex structure has been set up in the course of evolution. On the other hand, structural analysis can be seen as a first necessary step prior to a dynamical analysis which in turn enables to simulate networks and to study their response to perturbation. Usually, three main classes of biological networks are considered : protein interaction, gene regulatory, and metabolic. When analysing their structure, these networks are usually modelled as graphs, where vertices represent molecules (metabolites, genes, and proteins) and edges (directed or undirected) represent interactions between these molecules (the direction, when it is known, indicating which molecule is acting upon the other). For instance, in the case of a gene regulatory network, vertices correspond to genes and there is a directed edge from a gene coding for a transcription factor to every gene that this transcription factor regulates. The structure of a biological network may be apprehended by using a variety of measures, such as vertex degree , degree correlation , or average shortest path length . In this paper, we focus on the concept of motif. A network motif has been initially defined as a pattern of interconnections which occurs unexpectedly often in a network [5, 6]. The assumption generally made is that subnetworks sharing the same topology will be functionally similar. Over- (resp., under-) represented subnetworks may therefore correspond to conserved (resp., avoided) and thus important (resp., vital/detrimental) cellular functions. In the context of regulatory networks, simple patterns such as loops may be interpreted as logical circuits controlling the dynamic behaviour of a network. If the over- and under-representations of network motifs are often assessed via simulations of random networks in practice, approximations of the subgraph count distribution in various random graph models have been proposed in the literature. Some of these approximations can be found in the book by Janson et al. or in more recent studies such as those by Stark , Itzkovitz et al. , Camacho et al. , and Picard et al. .
A limitation of the notion of topological motif is that in many cases the same subgraph may in fact correspond to different functions, depending on the nature of the vertices that compose it. This is typically the case for metabolic networks whose fullest representation is in terms of a bipartite graph with two sets of vertices, one corresponding to reactions and the other to chemical compounds, those reactions are required as input or produced as output. Topological motifs which neglect vertex labels (for the reactions and/or the compounds) may associate completely different chemical transformations, while motifs that took such labels into account but enforced topological isomorphism would miss the fact that some sets of similar transformations may occur in different order. A biological example of the latter is given in the simple case of linear sets of transformations in Figure 1, where rectangles are reactions and circles are compounds. More complex examples are discussed in Lacroix et al. . Similar sets of transformations in the metabolic network of the bacterium Escherichia coli . Moreover, in some situations, as, for example, in the case of protein interaction networks, the topology of the network is not fully known. Indeed, high-throughput experiments used to obtain large-scale protein interaction data are notoriously noisy, that is, they may detect interactions when there is none (false positive) and they may miss existing interactions (false negative). In this context, it may be inadequate to look for exact repetitions of a pattern. An alternative definition has thus been proposed, where a motif is defined by using the labels of its vertices and only connectedness of the induced subgraph is required . A coloured motif is defined as a multiset of colours (vertex labels), that is, a motif may contain colours whose multiplicity are greater than 1. The cardinality of a motif, that is, of the multiset, will be called the size of a motif. An occurrence of a motif is defined as a connected subgraph whose labels match the motif. The enumeration of coloured motifs is a nontrivial task which has been the subject of several works [12, 13] which allowed to establish the complexity of the problem and provide algorithms to efficiently detect all the occurrences of a motif in a graph. In practice, current methods now allow to enumerate all the motifs of size 7 of a graph representing the metabolic network of a bacterium in less than two hours. Beyond the time complexity of the task, a major challenge that remains open is to make sense of the potentially very large output of such an enumeration procedure, especially when the focus is not on a single motif but on all motifs of a given size. Ideally, one would need a method to rank the motifs according to their biological relevance in order to prioritise a small number of motifs for downstream analysis. However, the notion of biological relevance is generally ill defined, and a classically used approximation is its statistical significance (or exceptionality). The exceptionality of a coloured motif, that is the over- or under-representation of the motif with respect to a null model, can be assessed by comparing the observed count of occurrences of a motif to the expected count of the same motif under a null hypothesis. Up to now, this procedure was performed (e.g., in MOTUS , http://pbil.univ-lyon1.fr/software/motus/) using simulations: a large number of random graphs were generated and the motif of interest was sought in each one, generating an empirical distribution of the motif count to which the observed count could be compared in order to derive a -score and a -value. The main limitation of this procedure is that it adds a multiplicative factor to the time complexity of the algorithm. Moreover, it is not trivial to choose the optimal number of simulations to perform in order to get a satisfactory estimation of the -value. As a rule of thumb, in order to estimate quite accurately a -value of 1 over , at least simulations should be performed. In this paper, we propose a new approach for assessing the exceptionality of coloured motifs which do not require simulations and therefore circumvents the previously mentioned limitations. We were able to establish exact analytical formulae for the mean and the variance of the count of a coloured motif in an Erdös-Rényi (ER) random graph model. Thanks to these results, one can now derive a -score for each motif and therefore rank them according to their exceptionality. We then worked on modelling the complete distribution of the count of a coloured motif in an ER random graph model. To this purpose, we performed a large number of simulations, using different colour frequencies for the motif and different number of vertices and edges for the graph. We could establish that the Poisson distribution was not appropriate whereas the Pólya-Aeppli distribution was a good and better approximation than the commonly used Gaussian distribution. The choice of a Pólya-Aeppli distribution was driven by the following facts: (i) motif occurrences overlap in a network, as shown in Figure 1; (ii) compound Poisson distributions are particularly adapted to model counts of clumping events [15, Chapter 9]; (iii) Pólya-Aeppli approximations are efficient for the count of words in letter sequences . These results can in turn be used to derive a -value for each motif, and, therefore, to introduce a cut-off for deciding which motifs should be selected for downstream analysis. To our knowledge, there has been no previous work on the significance of coloured motifs in random graphs. This is the reason why we started by focusing on the more general random graph model that is available. We are aware that this may not be the most suitable model to describe the structure of a biological network. However, we argue that this work provides a first necessary basis which can later be extended to richer models, such as the promising mixture of Erdös-Rényi models proposed by Daudin et al. .
We consider a random graph with vertices . We assume that random edges are independent and distributed according to a Bernoulli distribution with parameter (the so-called Erdös-Rényi model). Moreover, vertices are randomly and independently coloured as follows. Let be a finite set of different colours and a probability measure on : is then the probability for a vertex to be coloured with . In a metabolic network, the colours of reaction vertices can represent classes of chemical transformations; in regulation networks, the colours of gene vertices can represent functional classes. For defining these classes, the EC number hierarchy (http://www.chem.qmul.ac.uk/iubmb/enzyme/) or Gene Ontology (http://www.geneontology.org/GO.doc.shtml) is classically used. We consider motifs as introduced in Lacroix et al. : a (coloured) motif of size is a multiset of colours . Colours from a motif may not be different, that is, one may have for some . We then denote by the multiplicity of the colour in . When there is no ambiguity, will simply be denoted by . The notion of multiplicity of a single colour in will be extended to a multiset of colours in Section 3.2. We now define an occurrence of such a coloured motif. To this purpose, we introduce the following notation. If are different indices from then represents the subgraph of induced by the vertices . Let be the set of all the subsets of size from . We say that a motif occurs at position if and only if is connected and the colours of , denoted by , are exactly . corresponds, then, to the set of possible positions for the occurrence of a motif of size . Figure 2 gives an example of a motif and its occurrences. Example of a graph and a motif. The motif occurs three times in the graph, at positions and . The probability for to occur at position will be given in Section 3.1. This section will provide analytical formulae for the mean and the variance of the number of occurrences of a coloured motif in a random graph. It involves the computation of some probabilities of connectedness. The generalisation to the number of occurrences of a set a coloured motifs will be done in the supplementary material. where is the occurrence probability of the motif and is given below by (6). where denotes the probability for a random graph (Erdös-Rényi model) with vertices and edge probability to be connected (by definition, ). The terms and are now separately calculated. where is the multiplicity of in . For instance, if , and then the multiplicity of in equals 2 whereas the multiplicity of equals 1. For the other cases, no general formulae have been found so far but for small values of one can automatically enumerate all the solutions thanks to the edge binary tree, as described below. As an illustration, the case (and ) will be detailed. where is any subgraph of vertices. Since is typically small, both probabilities can be computed by enumerating all possible subgraphs and . This can be done by traversing the complete edge binary tree associated to the potential edges of that is, to the binary tree whose branches are labelled according to the presence or absence of edges in the subgraph . 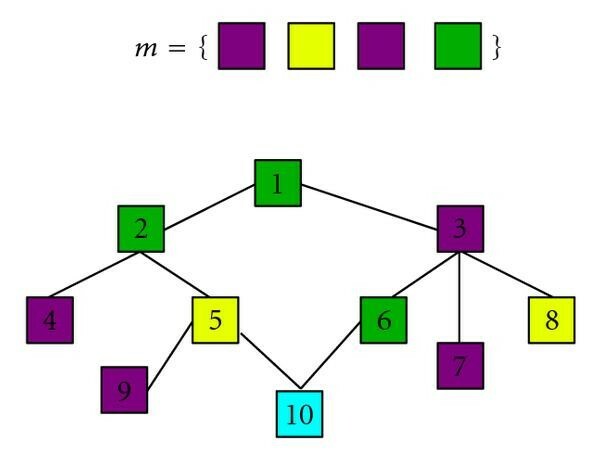 This tree is composed of levels, one for each potential edge and each internal vertex in this tree has two sons: the left one corresponds to the presence of the corresponding edge in the graph whereas the right one corresponds to its absence. It follows that each path from the root to a leaf corresponds to one of the possible graphs of size . Figure 3 gives an example for . Vertices are labelled , the higher level corresponds to the edge , the middle one corresponds to the edge and the lower level corresponds to the edge . Leaves corresponding to connected graphs are drawn with a square. In practice, the connectedness of a graph can be checked thanks to its adjacency matrix to the power . Indeed, a graph of size with adjacency matrix is connected if and only if contains no zero (every vertex can be reached from any vertex in at most steps). 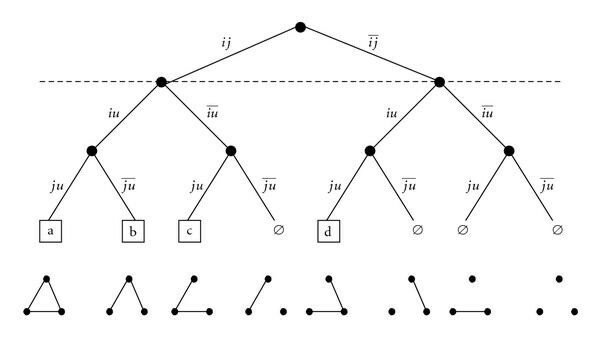 Additionally, the binary tree is built such that all pairs of common vertices between and are at the top levels. The probability of each connected graph of size can then be easily calculated when traversing the tree and likewise for both probabilities appearing in (16). Finally, we obtained analytical formulae for the variance. Complete edge binary tree for vertices , and . Branches are labelled according to the presence or absence of edges: label for instance, means that and are connected, whereas means the opposite. Leafs which correspond to connected subgraphs are represented by a square. No theoretical results exist so far on the distribution of coloured motifs in random graphs. In this paper, we propose an approximation for this distribution. Thanks to simulations, we first studied the quality of the normal approximation which is classically assumed, especially when using -scores [5, 12]. However, network motif occurrences tend to overlap in networks. It is well known from probability theory that compound Poisson distributions are more relevant than Gaussian distributions to model the count of rare and clumping events. Besides, a compound Poisson approximation for the count of particular subgraphs (topological network motifs) has been proposed by Stark  under certain asymptotic conditions on the ER random graph model. Moreover, by analogy with pattern occurrences in letter sequences , Picard et al. recently investigated a particular compound Poisson approximation, namely, a Pólya-Aeppli approximation, and concluded that this distribution fits well the count of topological network motifs. The Pólya-Aeppli distribution (denoted by ) with parameters is the distribution of , where the number of clumps is Poisson distributed ( ) and the size of the clumps is geometrically distributed ( ). Its mean is equal to and its variance equals . We have then also considered the Pólya-Aeppli approximation. We did not investigate the Poisson approximation because, as we can see on Table 1, the variance of the count (whatever the coloured motif) is quite different from the mean count. Quality of approximation of the count distribution for and . The empirical mean , variance , and cumulative distribution function have been obtained thanks to 10 000 random graphs. are the parameters of the Pólya-Aeppli distribution. and are the Kolmogorov-Smirnov distances. For then , is the quantile of the normal distribution (idem for the Pólya-Aeppli distribution). We have simulated 10 000 Erdös-Rényi random graphs with vertices ( ) and edge probability . Vertices have been randomly coloured with 5 colours ( ) and according to the following colour frequencies: . These choices for , , and allow to get coloured motifs of size 3 with a wide range of expected counts. We have then selected 14 motifs of size 3 to cover both this variety of counts and different multiplicity pattern: , , , , , , , , , , , , and . 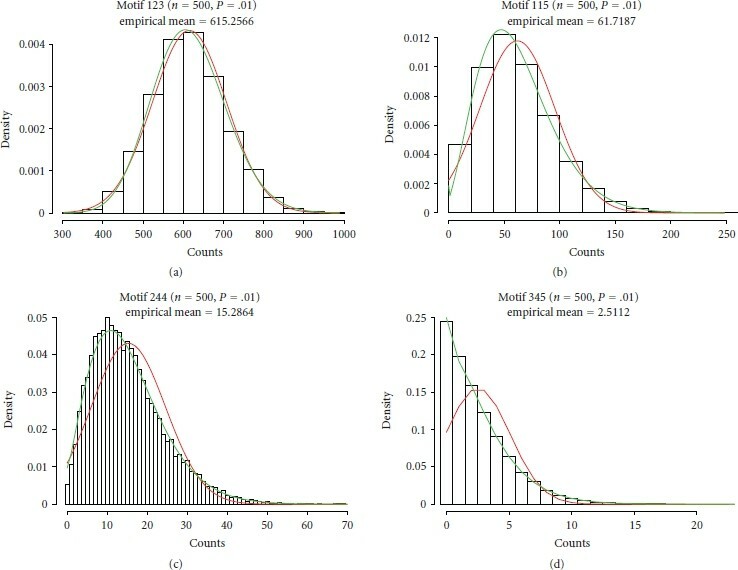 For each motif and each couple , we then obtained an empirical distribution which has been compared with both the normal distribution and the Pólya-Aeppli distribution with and (see Figure 4 for 4 representative examples). Empirical distributions for the count of motifs , , and in random graphs with and . The empirical means are, respectively, 615, 61, 15, and 2. The red (resp., green) curves correspond to the ad hoc normal distributions (resp., Pólya-Aeppli distributions). To measure this quality, we adopted two criteria: (1) the Kolmogorov-Smirnov distance which measures the maximal difference between the empirical cumulative distribution function (cdf) and the cdf of the normal or the Pólya-Aeppli distribution. The closer to 0 the KS distance, the better the approximation. (2) 1 minus the empirical cdf calculated at the and quantiles of the normal or of the Pólya-Aeppli distribution. The closer to 1% and 0.1% these values, the better the approximation. Results for different values of and are very similar. 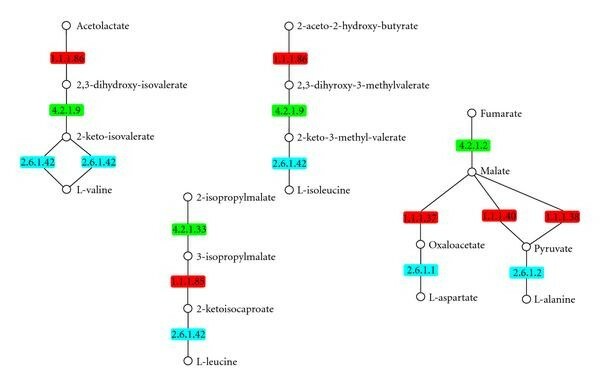 We only present here the ones corresponding to and because these values are very close to those observed in real cases such as the metabolic network of E. coli as considered in Lacroix et al. . Nevertheless, all results are presented in the supplementary material. We can first notice just by eye (see Figure 4) that the normal distribution seems satisfactory for frequent motifs but the rarer the motif, the worse the goodness-of-fit. The Pólya-Aeppli distribution seems to fit quite correctly the count distribution whatever the motif. These initial impressions are emphasised when we look at the Kolmogorov-Smirnov distances (see Table 1). The ones for the Pólya-Aeppli distribution are always smaller than those for the normal distribution and sometimes much smaller. In fact, the distance to the normal distribution is quite large for very rare motifs (typically when ). If we now concentrate on the distribution tails by looking at the empirical probabilities to exceed the 99% or 99.9% quantiles and , we can also notice that they are closer to 1% or 0.1% for the Pólya-Aeppli distribution than for the normal distribution. For extremely rare motifs, quantiles for both 99% and 99.9% could not be correctly calculated because the corresponding Pólya-Aeppli distribution is both discrete and concentrated around 0. The values for the empirical tails provided in the table are therefore not meaningful in such cases, but thanks to the very small KS distances, we can check that the approximation is still good. Finally, observe that most of the time the normal distribution underestimates the quantile (the empirical right tail is overestimated) leading to false positives. In this paper, we proposed a new way to assess the exceptionality of coloured motifs in networks which do not require to perform simulations. Indeed, we were able to establish analytical formulae for the mean and the variance of the count of a coloured motif in an Erdös-Rényi random graph model. Furthermore, using simulations, we showed that the motif count distribution can be quite accurately approximated with a Pólya-Aeppli distribution, and that neither the Gaussian nor the Poisson distributions are relevant. Altogether, these results now allow to derive a -value for a coloured motif without performing simulations. Clearly, when several motifs have to be tested, which is the case in the context of motif discovery, one has to control for multiple testing. A conservative strategy that is classically used and that we would recommend is then to apply a Bonferroni correction. In this work, we did not investigate the case of long motifs, but we can anticipate that motifs containing submotifs which are exceptional will tend to be exceptional themselves. This type of phenomenon is also observed for patterns in sequences and a classical way to deal with it is to control for the number of sequence patterns of size (by using a Markov model of order ), when assessing the exceptionality of patterns of size . However, in the case of networks, the problem is far from trivial and it is unclear, even for small values of if the space of random graphs verifying these constraints will not be too small. In the worst case, this space may even be reduced to the observed graph itself. Also in the case of very rare motifs, the expected distribution of the count is essentially concentrated around 0. Therefore, a single occurrence of such a motif will often be sufficient for it to be considered as exceptional. If we now consider the extreme case of a coloured graph, where each vertex is assigned a different colour, then all possible motifs will be very rare and, therefore, they may all be detected as exceptional. In practical cases, such as for the network representing the metabolic network of the bacterium E. coli, the situation is less dramatic but indeed many colours are present only once. This issue may be partially addressed by considering a random graph model, where the colours and the topology are not independent anymore. This would allow to discriminate between infrequent poorly connected colours and infrequent highly connected colours. Motifs containing the latter type of colours would be expected to have more occurrences and should therefore not be systematically considered as exceptional when they have a single occurrence. More generally, we considered in this paper a very simple random graph model. Even though we think this work was necessary to establish a framework for accessing the exceptionality of coloured motifs, an important step is now to extend these results to other models of random graphs which better represent the structure of real networks. Different types of models have been proposed in the literature for this purpose, for instance, small-world networks, scale-free networks, preferential attachment models, and fixed degree distribution models. However, these models do not provide the probabilistic distribution on edges which is required to compute the occurrence probability of a motif and the probability of two nondisjoint occurrences. Moreover, it has been shown that subnetworks of scale-free networks lose the scale-free property . This is a real drawback for modelling biological networks because they usually correspond to the partial knowledge we have of a system and are therefore far from complete. An interesting issue would be to generalise our work to a mixture of ER random graph models. These models seem indeed very flexible and are able to fit nicely biological networks . Finally, we think there is still room for improvement on the approximation of the motif count distribution. Indeed, no theoretical evidence has been found so far supporting the use of a geometric distribution for the clump size. Analytically, getting the third moment and eventually the fourth moment of the count could certainly allow to investigate other distributions. The authors would like to thank Etienne Birmelé, Jean-Jacques Daudin, Catherine Matias, and Stéphane Robin for helpful discussions about the moment calculations. They particularly thank Jean-Jacques Daudin for providing a MATLAB program to automatically compute the term . They also thank the anonymous reviewers for their helpful comments and suggestions for improving the manuscript. This work has been supported by the ANR (NEMO Project BLAN08-1_318829, REGLIS Project NT05-3_45205, and MIRI Project BLAN08-1_335497) and the ANR-BBSRC (MetNet4SysBio Project ANR-07-BSYS 003 02).